Ever since Artemis began tracking the cat bond market in 1996 we’ve been waiting for a $10 billion issuance year, but it’s taken 21 of them to get this close to it. As of today, with the completion of Tokio Millennium Re’s $430 million Spectrum Capital Ltd. (Series 2017-1) cat bond, the market has reached a new annual record for issuance, with 2017’s total issuance now $9.14 billion, which just surpasses the previous record set in 2014 of $9.09 billion. At the same time catastrophe bond risk capital outstanding is now set to end this quarter at a new record high, once the remaining two deals that are still in the market are completed. This year has already seen a number of records set, with a record first-quarter of cat bond issuance quickly followed by the largest single quarter of issuance ever in Q2, for which the total will rise further before the end of this month. The outstanding catastrophe bond market even reached $29 billion for the first time ever at the beginning of this month, although this has now declined slightly due to June maturities outstripping new issues. The record pace of catastrophe bond issuance in recent weeks has helped some ILS investment managers to put new capital to work, albeit not in a significant manner yet as so much has been recycled from maturities. But, Artemis’ investor sources suggest that a number of new end-investors have also entered the market this quarter, thanks to the greater availability of cat bond assets to allocate to. 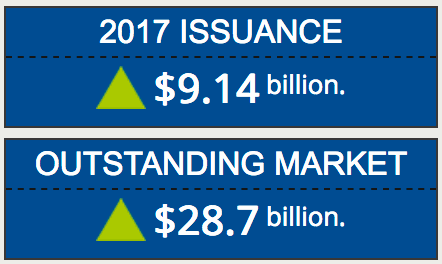 2017 has been a quite amazing story of catastrophe bond issuance accelerating ever since the start of the year. Many analysts and followers of the cat bond market were forecasting a difficult year, due to the record high levels of maturing bonds and the expectation that reinsurance firms would compete strongly to win over sponsors. But the insurance-linked securities (ILS) market and its investors have sharpened their pencils, offering very keen pricing to sponsors and recycling capital freed up from maturities to deploy into new issuance at a rapid pace. This turnover and attractive pricing has helped sponsors achieve increased deal sizes, while pricing has been largely comparable with traditional reinsurance, as the rates-on-line of traditional and alternative products continued to converge. Hitting a new annual record so early in the year is testament to the expertise in this market, which can now turnaround a transaction for a sponsor in record time. By working closely together, ILS market participants such as brokers, bankers, insurance managers, lawyers, risk modellers, and of course the all important ILS fund managers and their investors, have made the catastrophe bond into a risk transfer option that more and more cedents are looking to for core slices of their reinsurance and retrocession coverage. $10 billion seems easily reachable, in fact it would be a massive shock if we didn’t get there in 2017. But just how high issuance can go is anyone’s guess. If the ILS market can remain so competitive throughout the rest of 2017 we could see a full-year total that nobody would have forecast even just a few months ago. As ever, you can analyse this market with Artemis, as we track the development of the catastrophe bond and insurance-linked securities (ILS) trade, with every transaction recorded in their Deal Directory, Cat Bond Market Dashboard and our charts, data & analytics enabling users to analyse cat bond issuance and the market’s history more closely. Subscribe to Artemis’ real-time email alerts in order to always keep up to date with the developing ILS and alternative reinsurance market.